A complete tutorial about radar chart through which you can learn definition, benefits, drawbacks of Radar Chart and how to create it. An automatic tool for drawing Radar Chart is available. Radar chart is a graphical way to compare data by displaying data in a "web-like" form looking like spider web. So it is also known as spider chart or graph. Usually, it is applied to evaluate multiple alternatives based on multiple criteria. It can be divided into filled radar chart or radar chart with markers. 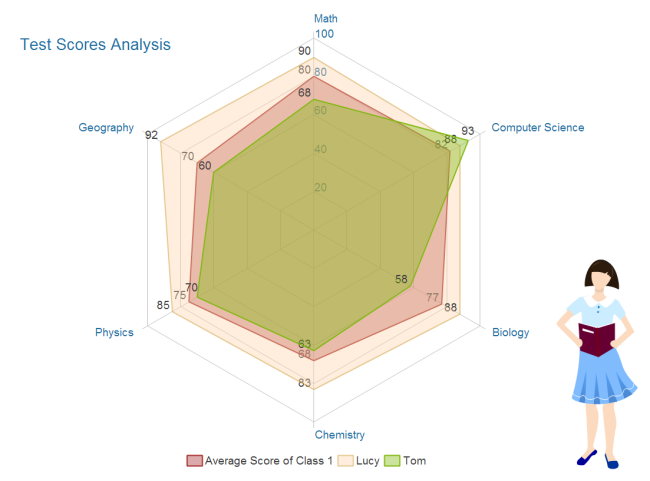 Filled radar chart is better for demonstrating comparison by using different fill colors. See a brief Radar Chart Guide in slides. To visually show in one graph the size of the gap among different series, such as a number of both current performance areas and ideal performance areas. The following benefits are reasons for the popularity of radar chart. Clearly displays the important categories. If done well, clearly defines full performance in each category. 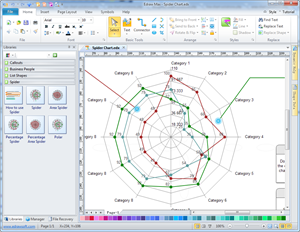 In Edraw, you can experience a worry-free solution to make radar charts. No need to worry about drawing skill. No need to worry about time limit because you can finish a radar chart in only 3-5 minutes. No need to worry about share for a variety of formats Edraw supports, including PDF, Word, and PowerPoint jpg and so on. 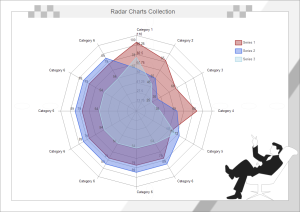 Follow 6 easy steps to gain your own visually appealing radar chart. 1. Identify the series to be compared. 2. Generate criteria to rate each serie. 3. Rate each alternative based on criteria. 4. Select a suitable template and set relevant appearance options. Set and label the axis arms of the chart (one arm for each criterion). 5. Label each alternative's ratings on the chart. When you enter the data, the shape changes automatically. 6. Add some final touches such as background or clipart to beatify it. As you can see from the guide, no drawing is required throughout the whole process. Even novice users can handle it fast and easily. Every coin has two sides. Radar chart also has some drawbacks in data visualization. Drawback 1: Radar chart cannot show subtle issues clearly. Radar charts tend to illustrate comparisons through general rating while many evaluation criteria are multifaceted. Drawback 2: It is cumbersome to compare values on non-adjacent axes, which requires a surprising amount of conscious effort. To overcome these deficiencies, you can think about others kinds of charts or graphs to demonstrate data visually, such as bar chart, column chart and pie chart and so on. No more than 15 alternatives should be compared in radar charts or it will looks cramped. When rating, you had better use at least three criteria, more may be helpful, but more than seven may be too complex. It is helpful to standardize ratings to some uniform scale (for example 0-10, or 0-100%). Using different colors or markers to distinguish each alternative is best. Edraw offers the easiest way of creating a spider chart. Just use the pre-drawn templates and shapes in the library, you can set the data on the chart, or input a data file, Edraw will automatically generate a spider chart for you. You can apply your own custom-designed themes, to make your chart beautiful and attractive. It can be exported to PDF or other graphic formats. A radar chart is commonly used by consultants to demonstrate how a client organization compares to its competitors in a given industry. The template is easy to download and use for your own designs. Learn application of radar charts in Use Radar Charts for Problem Solving. 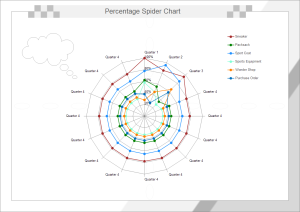 A percentage spider chart template is to graph multivariate data in a way that makes their relationships simple to discern.